Sometimes getting off the strip in Las Vegas you find some true gems. This was one of those outings. We ate dinner at a fabulous restaurant; Briggs Oyster Co. at the Suncoast Hotel Casino in Las Vegas. I started with a Shrimp Cocktail. It had the biggest shrimp I have even eaten. Following that I had their clam chowder. It was thick and had a good amount of clams in it. 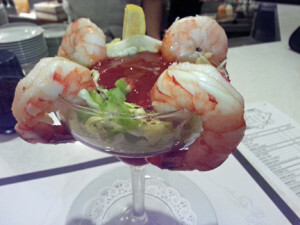 For the main course I had a Caesar shrimp salad. My mom had steamed clams, and a steak dinner. Everything we had we loved. We chose to eat at the bar as we could watch all the chefs cooking the meals. That alone was worth going. They had a bar of steaming/boiling pots that they cooked food in. We watched as they opened the oysters for oysters on the half shell. We also watched as they made the sushi rolls. The service was outstanding. It was a fun night out with great food. 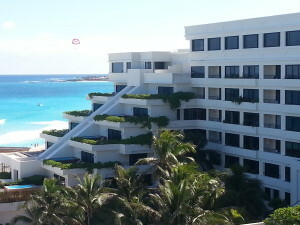 Here is the review I promised of the hotel we chose in Cancun Mexico. It was just a short ride from the airport. That is one of the upsides of staying near Cancun is that if you don’t have a long ride from the airport. When you stay in the Sian Ka’an category you are treated us as VIP’s. If you have a problem with your room be sure to ask the concierge or front desk to help you. Be articulate and tell them what they need to do to make you satisfied. Mostly be patient. This is a quiet romantic relaxed hotel. 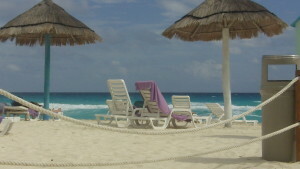 It’s sister resort the Grand Oasis Cancun which was much louder, crowded & busy. It is good to know what atmosphere your looking for when you book a hotel. This trip we wanted an adult only quieter resort and the Sens fit it nicely. The have larger room. I would request one with a plunge pool & deck. That the specialty reserved restaurants were included if you were Sian Ka’an. Reserved beach beds with drink & lunch service. The “Foam Party.” is one of our favorite activities but they only do it on Saturday. We loved the choices of restaurants all of which were excellent with so many menu choices we couldn’t try it all in a week. Don’t miss out on the Black Hole, Benazuza Specialty restaurants. We also loved the Maki Taco & Hippie Chic along with a lot more. We loved this resort built on different levels with lots of stairs, amazing food, fun activities, great beach, large clean rooms, and a relaxed atmosphere. The beach was good and they had lots of beach chairs. When you visit Lima Peru be sure to visit the San Francisco Church. It is a landmark in Lima. Great example of architecture, history, culture and art all in one stop. If you are booking a tour be sure that this is included in the itinerary. The tour of the San Francisco church includes the catacombs and the Peruvian painting of the last supper. This show is hosted by Debbie Gerber from boomer and Senior Travel TV. This is episode #77. Lima Peru a trip of cultural appreciation, architectural beauty and amazing people. We started our trip in Lima Peru with a short visit to the central square and souvenir shopping. I am happy to share this Video Podcast of trip to Lima Peru. Boomer and Senior Travel & Debbie Gerber share the video of her trip to Lima Peru. It is my hope that my travel show will help others who wish to travel to Peru. Also I appreciate my followers who want to see the world through my videos. Please share these show with others you know who have world travel on their bucket list. Video Podcast with Debbie Gerber of visit to the Xcambo Ruins near Telchac Yucatan Mexico. Free things to do in the Yucatan. Review of food and the El Pascador Restaurant.